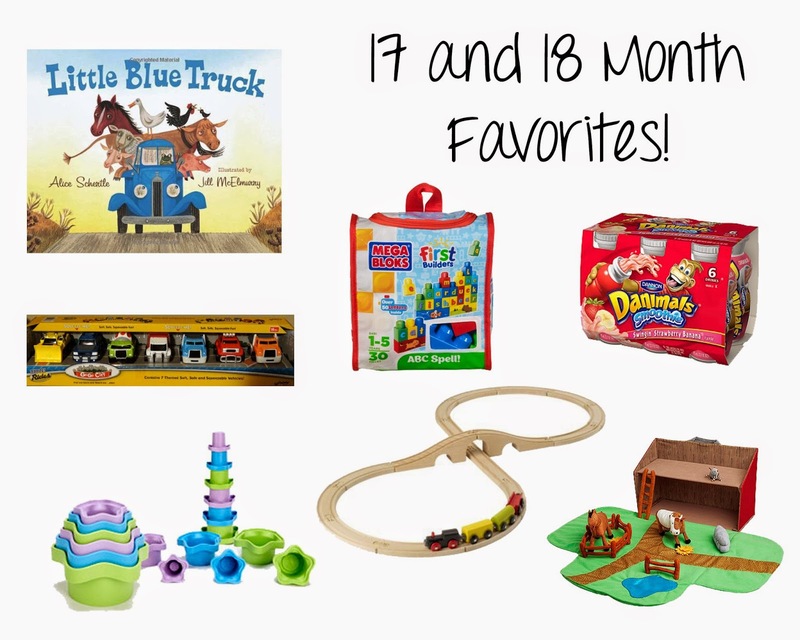 We recently ordered Little Blue Truck based on Laura's recommendation. We now read it every night before bed. Noah got these trucks from Nonna and Granddad at Christmas. Noah LOVES them because you can wind them up and let them drive. They are made of rubber so they are softer than most toy cars. We often bring them with us to restaurants and will "drive" them back and forth across the table to keep Noah entertained. These stacking cups are great! Noah likes to nest them together as cups and he loves it when Chris builds towers with them as well. If Noah is upset over something, Chris can usually distract him by building a tower for him to knock over. Noah loves building towers with his blocks now. When Noah got these for his birthday he just liked to destroy the creations we made. But now he likes building his own towers and looks so proud when he's done. They are often made with only red blocks (his favorite color). Ikea has some pretty cool toys for kids. This train set is so affordable, and Noah loves to play with it. We still have to put the tracks together for him, but he often brings them over to me during the day and wants to drive the trains around and around. Noah got this barn from a friend of mine for Christmas. The fence and ladder have velcro that help it stick to the felt and Noah likes it when I make the animal sounds. And while this isn't a toy, Noah is obsessed with these Dannon Yogurt Smoothies. He would eat 3 in a row if I let him. Now that he's become more independent, he is adamant that he holds the bottle to drink it out of a straw. I compromise with him and let him hold it as long as he sits on my lap instead of walking around with it. Whenever he goes to the fridge (which is a lot now), I know that's what he wants. What are some of your kid's favorite toys?? ?